Be the first to share your favorite memory, photo or story of Glen. This memorial page is dedicated for family, friends and future generations to celebrate the life of their loved one. Glen Mair was born on January 17, 1931 to William L. Mair and Christina M. Meighan Mair in Cleveland, Ohio. He died in his sleep on Monday, November 19, 2018 in Ponca City, OK after a short hospital stay. Glen was an only child. His parents had immigrated from Scotland to America in 1929 and Glen was the first born American in his family. He was raised with his parents, grandparents and an aunt in the same household and he considered this to be a regular family. He joined GOD’S family and was saved when he was a young lad and he attended a Baptist church in Cleveland. The stories of his young years of life in Cleveland entailed ice skating on the water flooded streets, being involved with the Cleveland Indians and working at a garage, towing cars and trucks. He met and saw a lot of famous football, baseball and soccer players (Satchel Paige and Bob Feller were some) and always had a story or joke to tell anyone. He completed all of his younger schooling in Cleveland, Ohio. In 1951 he knew the draft was coming and decided to enlist and was accepted in the Air force. His group was stationed in Weathersby, England for the entire time of the Korean Conflict. He was thrilled that he was able to visit his aunts and uncles and cousins not too far away while there. He was honorably discharged in 1955 as SSGT and shipped back to America. Department to aid in the Oil and Gas Accounting redesign. Glen traveled to all of the Divisions Offices around the USA and was welcomed for his help that was needed with the many changes going on. The chance to retire early came along in July 1993 and he joined his wife in the operation of The Emporium And The Gift Shoppe using his knowledge of the computer systems. He and Verona went to work each day together for a long time, the stores have been in business over 37 years. 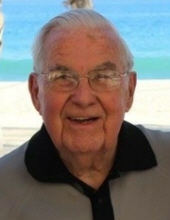 Glen was a good golfer and enjoyed teaching his grandson, Jason, the grand game of gentleman’s golf and playing the game with his family and with the Mertz Team. He also enjoyed bowling on a team for many years. Watching the football games on TV was a favorite also. Camping and belonging to the camping groups was also much enjoyed by him. Glen enjoyed being in the Extra Eyes Unit of Ponca City Police Department and was in the very first group to graduate from this volunteer group. He belonged to the Tippers business morning breakfast group and was always excited to go. The Ponca City Aviation Boosters Club was another he belonged to and enjoyed helping when he could. He also was a charter member of Northeast Baptist Church and served as its first treasurer and drove the church bus for many years. Son, Gordon was the first baby born at NE Baptist Church. Glen and Verona are members at First Baptist Church and have attended The Disciples class since it was started many years ago. Glen and Verona Morgan Streeter married on Good Friday April 13, 1979 in Ponca City by Rev. Evans T. Mosley. On April 1st, 1981 they started The Emporium and April 1, 1982 they purchased The Gift Shoppe. Your rarely saw them apart, always together in the most occasions. They traveled all over the world and enjoyed every trip that was made. Glen was an honest, reliable, kind, sharing, helping, caring and admired by many. He was truly a gentleman and will greatly missed. Thanks to daughter, Kathy for being there with Glen when it was needed so much. Survivors include: Verona, his wife of over 39 years, daughter, Kathy Pettigrew, daughter, Konni Streeter and husband, Gerald Spurgeon, son, Gordon and DeLana Mair, son, David Mair, former daughter in law, Vicki Mair, former daughter in law, Shannon Mair, grandson, Jason Pettigrew and wife, Victoria Pettigrew, granddaughter, Jaime Pettigrew, granddaughter, Kristen Mair, granddaughter, Meghan Davis Hull and husband, Michael Hull, grandson, Christopher Mair, grandson, Michael Davis, granddaughter, Rebekah Edwards and husband, Dylan Edwards, granddaughter, Sarah Bryan and husband, Joshua Bryan, nine great-grandchildren, London Pettigrew, Kooper Pettigrew, James Edwards, Ben Bryan, Emma Edwards, Will Ryan, Carson Hull, Aidan Hull and Elliott Hull and another baby Edwards on the way. A memorial ceremony for Glen will be held at 10:00 am on Wednesday, November 28, 2018 at the First Baptist Church in Ponca City with Dr. Michael Taylor officiating. Casket Bearers will be: Gordon Mair, Jason Pettigrew, Gerald Spurgeon, Mike Meeks, Bill Bridges, Allen Miller. Honorary Casket Bearers will be: PCPD Extra Eyes, Tipper’s Club. To send flowers or a remembrance gift to the family of Glen Leslie Mair, please visit our Tribute Store. "Email Address" would like to share the life celebration of Glen Leslie Mair. Click on the "link" to go to share a favorite memory or leave a condolence message for the family.